At Gotta Dance, our movement-based curriculum is age-appropriate and specifically designed for pre-school students. 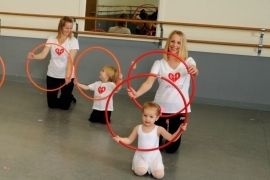 With professional instruction, we offer fun-filled classes for your little dancers aged 2½ – 5 years old. We know that dance education at an early age can be a catalyst for further development. Preschoolers develop strength in their large muscle groups and discover the joy and freedom in movement. So our educators work with students to build skills such as balance, motor and social skills. Each year, your dancer will build on skills learned in previous years in our classes. As a 2 1/2-year-old, your Baby Ballet dancer is curious and blossoming every day. Dancers enter our 30-minute class independently to discover the joy and freedom in movement, improve sensory awareness, eye-body coordination, body awareness, spatial relations and social skills. Our dance educators certainly provide the respect, tenderness, warmth and patience that allow these youngest dancers to thrive. As a 3-year-old, your Rainbow is glowing with achievement every day. We want to help your children glisten during this period. Their movement and balance are improving and so are their verbal skills. This age group is known for their agility and growing gracefulness. We teach your children intentional movements to strengthen their age appropriate developmental growth. Unicorns are confident, creative and imaginative. At the age of 4, your dancers possess all of these qualities and more. With better control over their movements and a growing understanding of concepts, we can begin to teach your dancers fundamental dance techniques. These movements combined with a lot of imagination will help dancers develop their growing dance vocabulary. 5-year-olds entering kindergarten are growing more confident day by day. These dancers can choose a combined Ballet/Jazz or Ballet/Tap class, based on their preferences. Kindergarten opens your dancers up and allows them to shine like the stars they will always be. By this stage, children are more confident and are beginning to move in a more mature manner. We focus on introducing and developing complex movements and dance combinations. With cognitive and muscle memory further developed, our educators build sequential dance exercises week-to-week. Creative movement is taught and then incorporated into class dances that establish an emphasis on technique. Your dancer’s feet will become more pointed, their posture will straighten and their recollection of sequential movement will improve. We encourage performance skills through age appropriate song choices and dynamic dance routines. The social and inquisitive nature of kindergartners is nurtured through instruction and partner activities. The Stars class offers a fun, fit and focused experience that completely engages your dancer’s mind, heart and body. Classes are 45 minutes and offered after school, on weekdays or Saturday mornings at each of our locations. Preschool Observation is the last 5 minutes of class during the last class of the month!